Very busy day today. I am thinking about doing a drawing for Illustration Friday. Nothing really going on tonight except work. I finished some of my freelance work, and moving on to the next thing. My mind is always on painting or drawing when I am working. Lyrics I heard today that I really liked. KT Tunstall..."I am me, the universe and you". The song is called the Universe & U. Who would say "I am me, the universe and you"? (God). 1. Read. Practically anything that is interesting. Favorite subjects, Artist biographies, Painting, Antiques, Graphic Design. 2. Listen to Music. Practically anything...I have very eclectic taste. Currently, the aforementioned David Gray, KT Tunstall and Imogen Heap. I am also a musician. I play 12 string accoustic guitar, write songs and sing. Music has been an important part of my life since I learned to play guitar as a child. 3. Make things. Anything. Drawings, designs, sculptures, paintings. Things out of found objects, string, wire, rocks, clay, wood, fabric, paper, etc. Here is a drawing I did a few weeks ago. 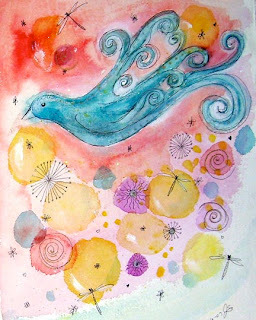 It is watercolor, pen and ink on handmade paper.